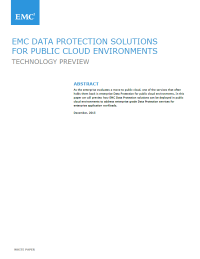 Download this white paper to gain insight on approaches for protecting workloads running in public cloud environments. Data Protection is a key tenet of sound IT strategy. In this new era of public cloud computing, the need for Data Protection is magnified and warrants special attention from complex IT environments.